Here at Chippewa Animal Clinic, we provide you with the highest quality veterinary care and emergency services. When your pet's health is on the line, you demand the best from your veterinarian! Dr. Christopher Hall and our team strive to meet your expectations at every turn - diagnosing and treating your pet in a warm, clean, and friendly environment. We are committed to providing the most advanced and compassionate patient care available with the highest quality of client service in an effort to improve the lives of companion animals and their families. We empower our healthcare team to educate our clients so they can make knowledgeable choices for their pet's health. We also provide the best customer care and create a personal bond of trust between our hospital team and our clients for a long lasting partnership in their pet's health and happiness. Dr. Hall pictured with his son Justin. I am a graduate of Kansas State University with a B.S. degree in Biology. It was here where I began a PhD. in anatomy and physiology with specific research regarding bovine respiratory disease. It was this research that led me to Michigan State University to continue graduate work regarding cancer and respiratory work with horses . I transferred to Ross University School of Veterinary Medicine to complete my Doctorate. At this point I began an externship in Raptor Medicine and Zoo Medicine at the University of Minnesota Raptor Rehabilitation Center and the Minnesota Zoo respectively . Following my externship, I began work at Chippewa Animal Clinic. Since then I have become tremendously involved in caring for the feral and homeless pet community in Chippewa County with numerous non-profit shelters and rescue organizations. I enjoy fishing and going to powwows. I also greatly enjoy spending time with my wife, Debra, and four children (Justin, Nick, Jada, and Alexia). My family and I couldn't be complete without our extended family of three dogs (Penelope, a great Pyrenees, Sir Issac Newton, also a great Pyrenees, and Whitney, a Spitz mix), two horses (Dean, a paint horse, and Shadow, a Morgan), and 5 fainting goats. Hello, I am Dr. Kate Kiekhaefer. I graduated from the University of Georgia College of Veterinary Medicine in 2002. I then practiced small animal medicine and surgery in Spartanburg, SC for two years before moving to Alpine, TX. While in Texas, I practiced mixed animal medicine and surgery for four years. In 2008 I moved to Sault Ste. Marie, MI and began working with the wonderful staff at Chippewa Animal Clinic. I have a large family that includes six dogs, four cats, five horses, and thirteen chickens. Welcome to Chippewa Animal Clinic, where I hope to meet you and your furry family member. My name is Rebecca. 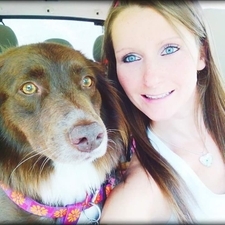 I am a licensed Veterinary Technician and have been with Chippewa Animal Clinic since 2005. I grew up just east of West Branch and moved to Sault Ste. Marie in 2003. My family includes my husband Mike, and my four fur children (Cicily, an Italian Grey Hound, Josie, a Miniature Pinscher, Kipsy, a doberman mix, and Verti, a domestic short hair). In my spare time I enjoy cooking, gardening, reading, and paper crafting. I love educating clients so they can make informed decisions for their beloved pets. Hello! My name is Lucas. I am from Reed City, MI but I have lived in the Soo for 12 years. I have one dog, her name is Chloe and she is a Saint Bernard. I also have 2 cats, Benjamin, and Wolf and four fish. I have a deep love and understanding for all animals, both domestic and wild. I have been working with animals for the last 8 years and it has been very rewarding! In my free time I enjoy hunting, fishing, hiking, canoeing, and spending time with my family. Animal Clinic in September of 2017. My favorite part of my job is seeing all the animals every day! Hi there! My name is Sami. I moved to Sault Ste. Marie from Raleigh, North Carolina. My favorite part about working at Chippewa Animal Clinic is just being around animals all day long. I love being able to help them and I'm learning a lot in the process! My family includes 3 dogs (Bella, a sweet little terrier mix, Chloe, a cuddly pitbull, and Roxy, a goofy rottie mix), my fiesty calico kitten Autumn, and my spikey bearded dragon Summer. In my free time, I enjoy playing with my dogs outside and spending time with my family. Hey there! My name is Jessica. I have been working in the veterinary field since 2007 and have worked at several clinics and hospitals around the country including North Carolina, Louisiana, and Texas. I eventually came back to Sault Ste. Marie to be with my family and I love working at Chippewa Animal Clinic! I have a degree in accounting, but couldn't imagine my life not working with animals every day. I also have dogs of my own that I love like most people love their children. My fur-kids have grown to five! My dogs are Angel, Buck, Homer, Lucy, and Maggie -- all of whom are quite possibly a little too spoiled (if there is such a thing)! In my free time I enjoy helping with animal shelter events to raise money for other animals in need. I also enjoy participating in mud run events with my boyfriend and spending time with my adorable nieces and family. Hello! My name is Rachael. I am originally from Stephenson, Michigan, and have lived in Sault Sainte Marie for about 1 year. I recently joined the veterinary field, and am currently studying to become a Licensed Veterinary Technician. Animals are a huge compassion of mine, and I couldn't imagine doing anything else! I love working at Chippewa Animal Clinic, helping furry friends everyday! Hello! My name is Priscilla. I am the office manager here at Chippewa Animal Clinic and have been working with our team since 2004. I enjoy helping our clients and their pets. I have a wonderful daughter, Aubrie, whom I love very much. My family also consists of my two dogs (Sophie, a terrier mix, and Sonny Boy, a yellow lab mix) and two rescued cats (Nemo, affectionately called Million Dollar Kitty, and Lilly). My interests include camping, boating, dancing, and traveling. I hope to see you and your critters soon! Hello. My name is Jolene. I have been with Chippewa Animal Clinic since 2005. I must say, my favorite part of the job is talking with our clients about their pets and of course getting the occasional lick in the face. Our staff considers me the mom of the clinic. I work closely with our office manager taking care of all the "behind the scenes" office responsibilities it takes to keep a good animal practice up and running. My two dogs, Roxy and Binnogii are my babies. I couldn't imagine life without animals, as they bring me so much joy.